The jaguar was revered as a symbol of power and strength in several pre-Columbian cultures including the great Maya and Aztec civilizations. It is a solitary opportunistic creature at the top of the food chain. In 2011, when the book, Battle Hymn of a Tiger Mother was published, I asked myself what animal could best describe Mexican mothers? The more research I did on the panthera onca, the more similarities I found between it and the women in my own family. 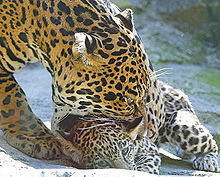 As Mother’s Day fast approaches, not only do I find myself racking my brain for the perfect gift, I also find myself reflecting on what makes Latina moms so unique and so majestic like the mythical jaguar. The jaguar’s present territory includes the Southern United States and Mexico all the way to Central America, Paraguay and parts of Argentina. Jaguar moms can be found all over the world and aren’t always Latina, but they almost always share one important characteristic, tough love. Unlike the Chinese Tiger mom, a Jaguar mom may not force her kids to play hours of chess, but she uses every opportunity to teach her children how to strategize in the game of life. In this era of instant gratification, it seems more and more difficult to raise niños agradecidos, appreciative children. Think you have what it takes to be a Jaguar mom? Take this short three question quiz and find out for yourself. a. Don’t have time right now and tell him to leave it on the counter. b. Give him a hug and kiss but ignore the mistakes. c. Grab a red pen, correct all the spelling and grammatical errors and hand it back with a smile. If you answered mostly C then you might just be a Jaguar mom, relentless in your pursuit of perfection, but never wavering in your love and admiration for your child. This Mother’s Day whether you have a Jaguar mom, a Tiger mom or a mom whose species is yet to be identified, celebrate her because all God’s creatures are special, even the mythical ones. I'm so a jaguar mom! Oh my!